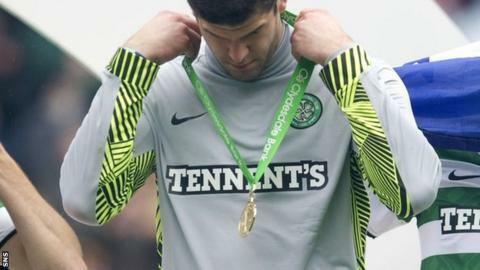 Celtic manager Neil Lennon hopes talks over a permanent deal for goalkeeper Fraser Forster can be concluded soon. Forster remains a Newcastle United player but a fee has already been agreed between the clubs. "His agent is in [on Wednesday] so we are hoping we can move things on pretty quick," said Lennon. "We have been delighted with him in the two years he has been here and are hoping we can bed him down for another two or three after that." The 24-year-old Englishman has made 90 appearances in his two seasons at Celtic Park and helped the Glasgow outfit win the Scottish Premier League title this term. He previously had loan spells at Stockport County, Bristol Rovers and Norwich City.